Forgive my craven nature, paperdoll fans… Anyways, I think this would look nice colored, maybe all in shades of some nice warm color, but I started it too late to give it a shot. Hope someone else does, though! Or maybe I will soon, or maybe I’ll do another contest. 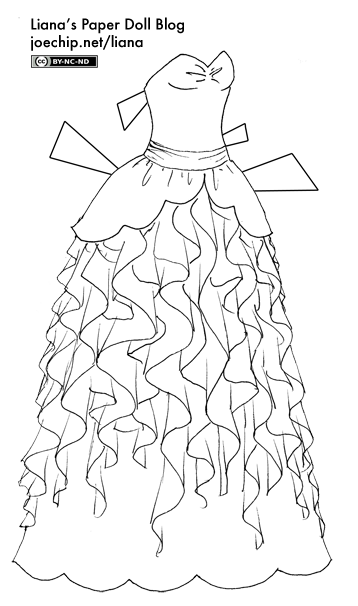 I still have to color the masquerade dress from the last contest, though. And would you look at that… I made it through a whole week. I’m posting this one a little late, admittedly, but it’s 10:45, and that’s well before midnight. Having Sunday as my day to sketch and think about the next week worked pretty well, so I’m going to keep doing that. See you on Mermaid Monday! These dresses are amazing-http://blog-imgs-21.fc2.com/s/u/g/sugarkeibranche/sugar03.jpg looks like a cross between a mashed box of chocolates and what Henry leaves a pile of in the yard. I clicked on the dress to get a closer look, and I noticed that it had a tiny bit of a bluish tint to it. Do all your black and white dresses have that? I think it’s pretty, even if it’s not as flamboyant as it should be. What colors would you picture this being? Oh good Lord, I think Chris would murder me in my sleep if I even suggested one of those dresses for my wedding dress. So many ruffles. But I love your dress. Makes me think of some of the prom dresses I’ve seen. I have to come up with a way to keep printing things off now that I’m back home so I can color this. Celestina, I see it in pink, myself, lighter bodice, peplum and underskirt, then darker (but not very dark) warm shades of pink on the ruffles and sash.